I did it! Today Jason taught class for me, so I stayed at home and got in the kitchen. 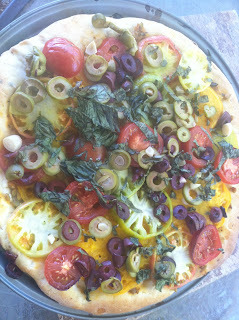 I made this heirloom tomato olive pizza sprinkled with fresh basil. The crust is a flavored crust of chili and roasted garlic. The full recipes will be in the next issue of the Vegan Culinary Experience. Also, since my recipe made two crusts and it is just Jason and I, made breadsticks out of the other crust and gave them away. Yay!